This customizable sterling silver necklace keeps loved ones next to the wearer's heart. Who was it that melted your heart all the way down, and then re-cast it with pure love? Your partner? Parent or grandparent? A darling pet? All of the above? It doesn't matter who taught you what love is: the important thing is that they did. Keep loved ones close to the heart with Kaleen Wolfe's handmade sterling silver necklace. 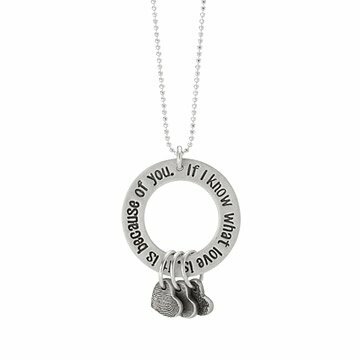 This keepsake bears the moving words, "If I know what love is, it is because of you." The customizable heart charms that hang from the pendant can be printed with any combination of fingertips or paws of special people and pets. Handmade in Pennsylvania. To preserve the patina, avoid exposure to lotions, perfumes, and chemicals. When not being worn, store in the cellophane baggie with the anti-tarnish square (included with each necklace).